Buy this course as part of the 2 course Reaktor bundle and save money! 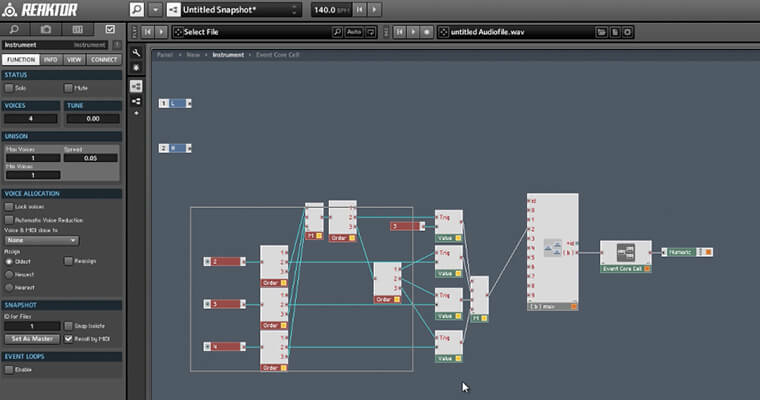 Reaktor Core is a complex and sophisticated programming environment that can be used to create almost any sound generator or effect you can imagine. However, even experienced Reaktor users are often confused by it *. In this course, we’ll show you how to use Core from the ground up – learn the advantages Core has over Reaktor Primary, how to take advantage of different signal types, and how to create basic building blocks for synthesis such as oscillators and envelopes. In addition, we cover the Partials Framework, an advanced set of tools released by Native Instruments to facilitate programming additive and modal synthesis. The Partials Framework is used as the basis for Razor, possibly the most popular Reaktor synthesizer ever. 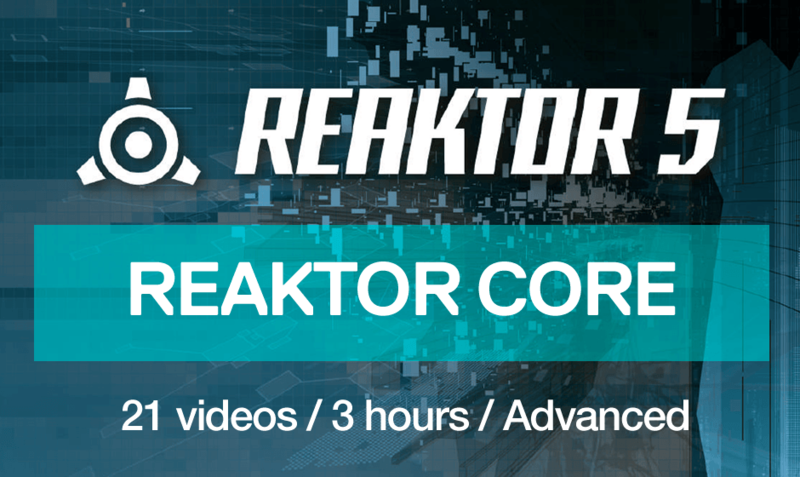 * We recommend you take our Reaktor Masterclass before you attempt taking this course about Reaktor Core. 01 Introduction to Signal Types – This video provides a basic grounding in the different available Signal Types in Core. Floats, integers, booleans and latches are covered. Along the way, we discuss basic logic in Core, and go over some basic Core modules that we’ll be using for the rest of the course. 02 Creating a Counter – In this video, we cover the creation of a counter from scratch. A counter is one of the most basic building blocks, used in everything from oscillators to stutter glitch effects. Basic Core concepts such as creating Quick Constants, and using the Sample Rate Clock (SRC) are also explained. 03 Creating Oscillators, Part I – Next, we expand the counter design from the previous video, and show how we can use it to create a ‘phase accumulator.’ The phase accumulator can then be used as the center of a simple sine oscillator. 04 Creating Oscillators, Part II – The oscillator we made previously is a little boring, so let’s add some frequency modulation! In addition, we add a gate sync function, and basic interface tips such as using Compact Board function and creating macros are covered. 05 Creating Oscillators, Part III – In this video, we add phase and amplitude modulation to our oscillator. We also show how to make a simple oscilloscope in primary to look at a single wavecycle of our oscillator, so we can compare it to something similar from Primary to make sure everything is working properly. 06 Introduction to Arrays – This video covers the basics of Arrays. I show how to read and write values, how to use an array in conjunction with a counter to record audio data, and how to use the stored audio as a sort of delay effect. 07 Optional Clocking – You can save an awful lot of CPU in Core by using a simple trick to turn off unused components. This is a great reason to use Core – you have a high level of control over your structure that is not possible in Primary. 08 Using Routers I – In this video, we show how to use Routers as efficiently as possible. We begin with a simple, but slow structure, and show how it can be improved. Example files of the created routers are included. 09 Using Routers II – Previously, we looked at the creation of a Core macro that acts like a Primary Distributor/Panner. In this video, I’ll show how we can easily convert the structure to work like a Primary Selector/Scanner instead. 10 Envelopes I – This video covers the creation of an envelope from scratch, using a counter and a routing system to determine which section (attack, decay, sustain or release) is currently active. The modulation macros in the expert menu section are covered as well. 11 Envelopes II – In this video, we modify the envelope created previously to have an ‘analog’ retrigger mode. In addition, we modify the envelope curves to be exponential rather than linear. No other program works quite the same. Because you can build so many different synths and effects, with Reaktor you must understand the workflow and layout to get maximum productivity and enjoyment out of it. Each video builds upon the previous one, so that by the time you’ve watched all 3 hours, you’ll have a better understanding of Reaktor than almost every musician or sound professional you know. 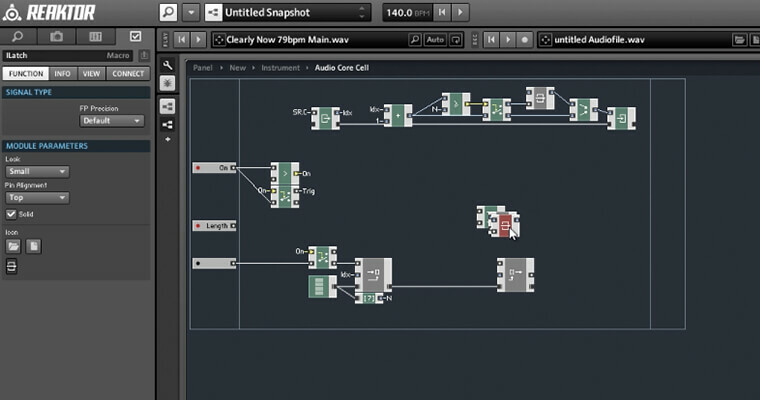 ” This is great training for Reaktor Core. I don’t think I would have known about the Partials Framework if I did not invest in this training. This training was very well worth every penny IMHO. I will be referring back to it often as I build with Core. 12 WaveTable – This video shows how to make a basic wavetable oscillator utilizing the oscillator structures we built earlier. This requires a waveform to work with, and I have provided a simple macro to record a single cycle of a wave for sampling. 13 Stutter Glitch I – This video creates a triggered stutter glitch effect from scratch, utilizing previously introduced concepts like arrays, counters and if-then statements. Using Core allows you to highly customize these structures to your liking, as we will see in the next two videos. 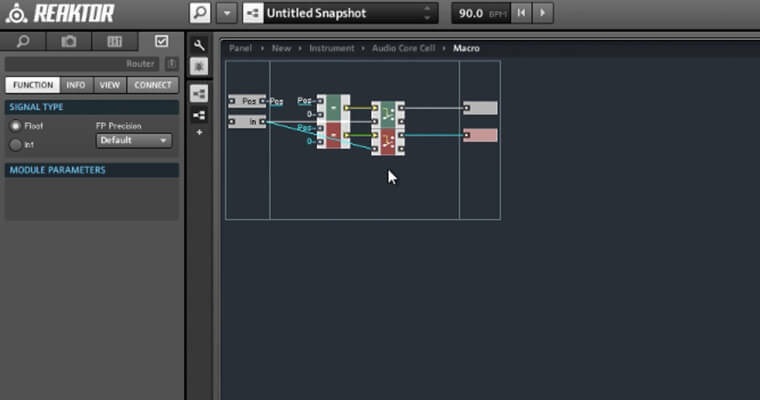 14 Stutter Gltich II – In this video, we add a speed control to our stutter glitch effect. With a few simple modifications, the effect can accomodate a reverse stutter effect as well. 15 Stutter Glitch III – Using the factory delay macros as inspiration, this video shows how to add interpolation to our stutter glitch to improve the overall sound quality. A sample ensemble is provided. 16 Partials Framework – Multiplexing – Native Instruments released the Partials Framework a few years ago to provide a common way of working around certain shortcomings in Core. The Multiplexing Library allows you to send an unlimited number of values into a Core cell on a single wire. This video introduces the Multiplexing Library and explains the basic functionality of it’s most commonly used macros. 17 Partials Framework – Chain Iteration – One of the major drawbacks of Core is the lack of an iteration module. The Chain Iteration Library is designed to work around this limitation, and in this video we cover the basic functionality of the Library. 18 Partials Framework – Sine Engine I – The Sine Engine is designed to simplify working with the Sine Bank module to create very complex ensembles. In this video, we show how to set up the Sine Engine. 19 Partials Framework – Sine Engine II – In this video, we take a closer look at the Sine Engine, and how it works. We use the multiplexing system to send and receive events, design a macro that controls the paramters of a Sine Bank module, and explore the structure of the Sine Engine. 20 Partials Framework – Bank Modulators – This video covers the basics of Bank Modulators, which are modulators designed to work with the Sine Engine. We show how to create a Sine LFO and use it to create a more interesting sound with our Sine Bank. 21 Partials Framework – Partial Modulators – In this last video, we cover the use of Partial Modulators, which can be used to create very complex sounds. A simple example ensemble is included which includes all the work from videos 18-21. 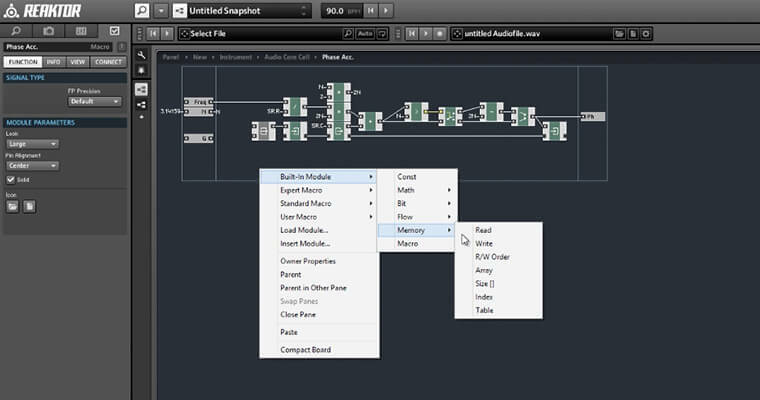 There’s no question Reaktor is one of Native Instrument’s most powerful software creations. It can be expanded in infinite ways. You can set up any combination of ensembles and instruments your crazy heart desires. The great thing is NI gives you a lot to kick things off: The program ships with over 70 synths, grooveboxes, sequencers and sound generators. Not only that, the Reaktor community is huge and very active. There are over 3000 more instruments and effects in the Online User Library. However Reaktor can be overwhelming. Once you take this course you can unlock the unlimited potential you have the keys to. Our Reaktor Tutorials take all the hesitation and anxiety out of coping with all that power and flexibility. With over 20 videos lasting over 3 hours, you get a roadmap through the inside guts of this amazing program. You’ll be more confident, work more efficiently, get more effective results, and laugh like a madman the whole time because you’ll be having so much fun. For a minimal investment in your audio education, these tutorials will move you ahead faster than you thought possible.